The properties of a rectangle, rhombus and square are discussed here using figure. Prove that the diagonals of a rectangle are equal and bisect each other. Let ABCD be a rectangle whose diagonals AC and BD intersect at the point 0. BC = AD (opposite sides of a rectangle). Hence, the diagonals of a rectangle are equal. ⇒ OA = OC and OB = OD. This shows that the diagonals of a rectangle bisect each other. Hence, the diagonals of a rectangle are equal and bisect each other. Prove that the diagonals of a rhombus bisect each other at right angles. Let ABCD be a rhombus whose diagonals AC and BD intersect at the point O. Also, we know that every rhombus is a parallelogram. So, the diagonals of a rhombus bisect each other. Therefore, ∠COB = ∠COD = 1 right angle. Hence, the diagonals of a rhombus bisect each other at right angles. Prove that the diagonals of a square are equal and bisect each other at right angles. We know that the diagonals of a rectangle are equal. Also, we know that every square is a rectangle. So, the diagonals of a square are equal. Again, we know that the diagonals of a rhombus bisect each other at right angles. But, every square is a rhombus. So, the diagonals of a square bisect each other at right angles. Hence, the diagonals of a square are equal and bisect each other at right angles. If the diagonals of a quadrilateral are equal then it is not necessarily a rectangle. 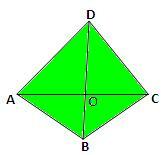 In the adjacent figure, ABCD is a quadrilateral in which diagonal AC = diagonal BD, but ABCD is not a rectangle. If the diagonals of a quadrilateral intersect at right angles then it is not necessarily a rhombus.